On January 15th the Indonesian police raided and destroyed the office of the ULMWP Political Bureau and arrested 10 occupants. 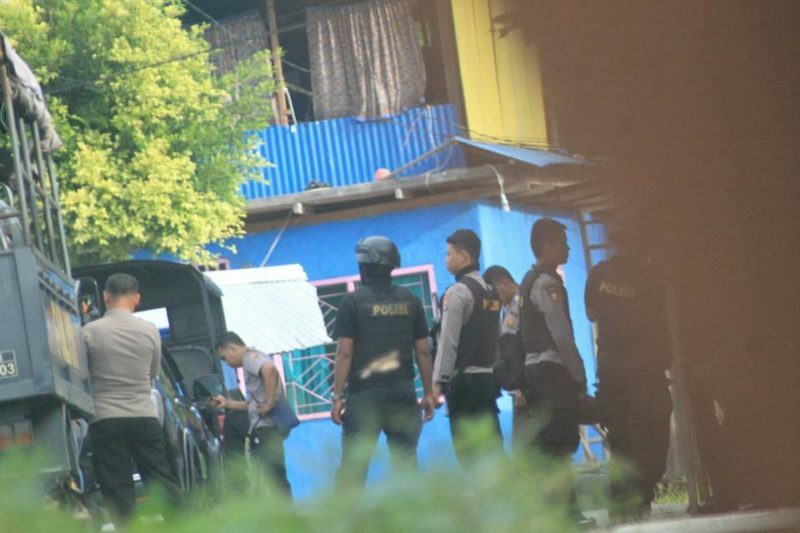 Indonesian Police, intelligence and military (TNI), carrying weapons in the form of firearms, came to the office of the United Liberation Movement for West Papua (ULMWP), and dismantled the Office Nameplate and conducted a raid on Tuesday (01/15/2019) in Sentani, Jayapura, Papua. This joint force came to the office on (1/15), around 5:57 p.m.
After the TNI-Police broke into the ULMWP Political Office, they took control of the office. They came using (2 patrol cars), (8 truck trucks), (3 strada cars) and (7 Avanza cars, used by intelligence units). The personnel deployed in this raid were in large numbers led directly by the Jayapura Indonesian police chief, Viktor Dean Mackbon. In addition to taking office assets, the aggressiveness of the Indonesian Police also damaged a large portion of the ULMWP Political Bureau office furniture by painting on the walls and doors using black paint. Then the police also threatened and asked residents of the houses around the office to leave their homes as soon as possible, the police installed a police line at the residents’ house near the office as a form of prohibition. Every bedroom of their homes, even cooking utensils and eating utensils were all ransacked by slamming and kicking until they were damaged. After being arrested, they were taken to the Jayapura police station. Until now, they are still detained at the police station. Jayapura Police Chief, Viktor Dean Mackbon, said that the action that what was done by the police of the Republic of Indonesia was official and at the behest of the state to disperse ULMWP from territory of West Papua. Thus, according to him, any organization including ULMWP that has not been registered administratively in the country of Indonesia, will be forcibly disbanded while the TNI and police were instructed to dismantle the name board of the ULMWP Political Bureau in Sentani, West Papua. United Liberation Movement for West Papua (ULMWP).